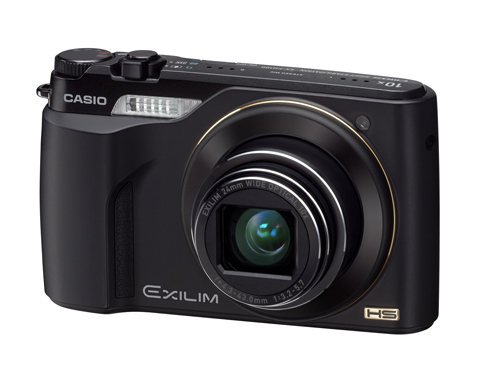 The CES show was the launchpad for a new Casio digital camera called the Exilim EX-FH100, touted as the 'world's first high-speed, high-zoom compact'. The CES show was the launchpad for a new Casio digital camera called the Exilim EX-FH100, touted as the ‘world’s first high-speed, high-zoom compact’. The 10.1-milion-pixel EX-FH100 sports a lens designed to deliver the 35mm viewing angle equivalent of a 24-240mm zoom. Casio claims that the EX-FH100 can shoot images at 40 frames per second (at 9MP resolution), limited to ’30 shots’. The camera features a 3in LCD screen (230,400 dot resolution) and CMOS-sensor shift image stabilisation. It can also record movies at up to ‘1,000 fps’. Users can press a button during normal movie mode (30fps), allowing them to switch to high-speed recording at 240fps or 120fps. The EX-FH100 measures 105×63.2×29.9mm and will carry a UK price of £279.